Transcript of audio, notes on the audio, photos, and additional information follow below. All Web addresses mentioned were functional as of 7-24-15. From the Cumberland Gap to the Atlantic Ocean, this is Virginia Water Radio for the week of July 27, 2015. That’s a sound you’re better off not hearing, except electronically. Have another listen for about 15 seconds, and see if you know what kind of highly social—and at times highly aggressive and defensive—insects made these sounds. And here’s a hint: if you see this kind of flashing yellow, don’t grab your jacket, just GO! If you guessed yellow jackets, you’re right! Those were the defenders of a nest hidden within a Blacksburg house’s wooden deck in June 2015. Yellow jackets are among over 100,000 insect species worldwide considered to be a kind of wasp. Many of these have “wasp” in their common name, such as paper wasps and spider wasps, while others don’t, like hornets or velvet ants. But they share the trait of having part of their abdomen narrowed into the so-called “wasp waist,” allowing the abdomen to move in many directions. Most wasp species, known as parasitoids, use this ability to insert their egg-laying organ, or ovipositor, onto or into other insects or plants, where the wasp lays one or more eggs. The eggs develop into larvae that eat the host insect or plant, often from the inside out. In contrast, the ovipositor of predatory wasps is modified into a venomous stinger, used to paralyze prey that is brought back to developing young in nests, including the elaborate paper-based nests f the social wasps—that is, paper wasps, yellow jackets, and hornets. As a group, wasps connect to water both directly and indirectly. 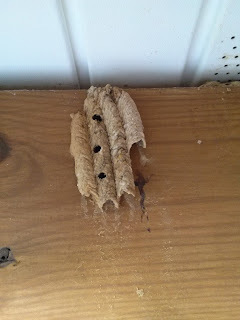 Direct connections include some parasitoid wasps using dragonflies or other aquatic insects as hosts; mud daubers visiting wet areas to gather mud for nest-building; social wasps using watery saliva to turn plant materials into paper; and some social wasps fanning their wings to evaporate water in order to keep their nest from over-heating. Indirectly, wasps influence the water uses and impacts of the wide variety of insects and other creatures that they parasitize or prey upon, including many species that are pests to humans. The yellow jackets sounds were recorded on June 18, 2015, 6:30 a.m., at a Blacksburg, Va., residence. Examples of wasps’ nests. Top: Mud-based nests of a type of solitary predatory wasp, mud daubers on a Blacksburg, Va., residents, July 2015. 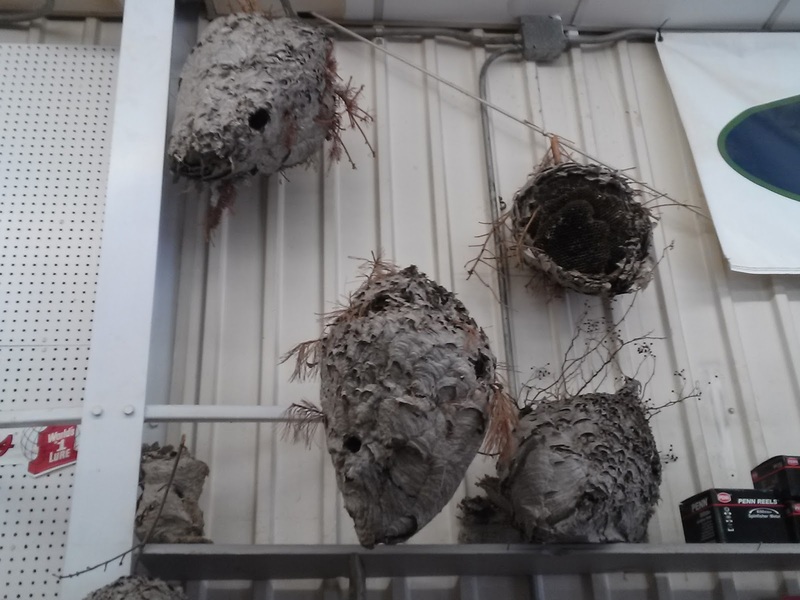 Middle: Nests of Bald-faced Hornets collected in Montgomery County, Va., on display in July 2015 at a Blacksburg, Va., business. 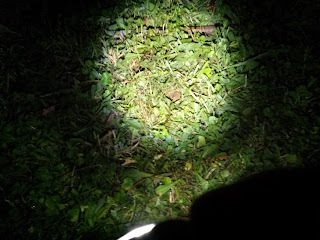 Bottom: A small, inconspicuous hole (brown area in center of photo) leading to an underground yellow jackets nest in a Blacksburg, Va., lawn, July 2015. The word “wasp” is believed to derive from a Germanic word for “weave,” related to social wasps’ nest construction. “Do’s and Dont’s of Avoiding Stinging Wasps,” from the Oklahoma Cooperative Extension Publication EPP-7305 (see full citation below under Sources): Do Not use sweet-smelling colognes, perfumes, and hair sprays in wasp areas. Do Not wear bright-colored clothing;wear tan, khaki, and dark-colored clothes. Do Not picnic, sit, or stand near trash cans, fallen fruit, or other wasp feeding sites. Do Not swat or move rapidly when a wasp visits you or your food or drink; move slowly. 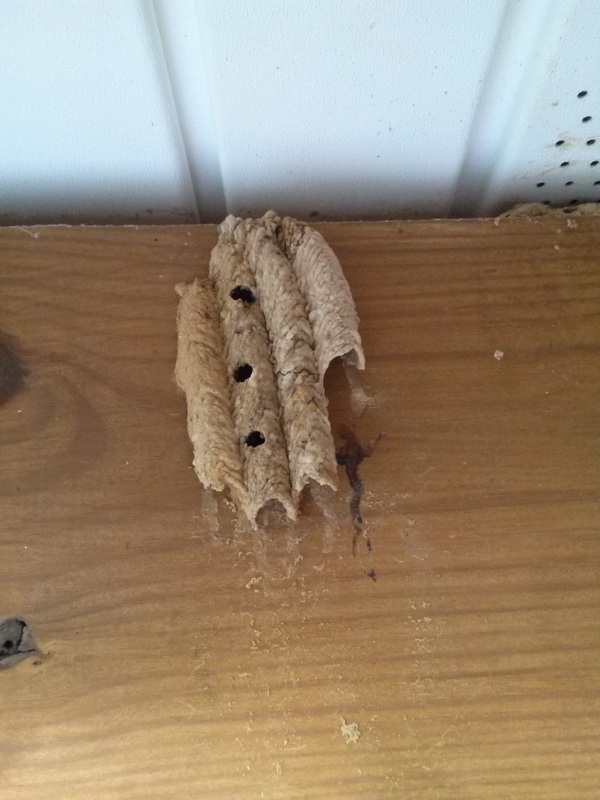 Do Not approach a nest; if you do disturb a nest, run away from attacking wasps. Do cleanup food and drink refuse, clean trash cans, and fit them with a tight lid to reduce wasp visits. Eric R. Day, “Yellowjackets,” Virginia Cooperative Extension Publication ENTO-49NP, 2013, available online at http://www.pubs.ext.vt.edu/ENTO/ENTO-49/ENTO-49.html. Howard E. Evans and Mary Jane West Eberhard, The Wasps, University of Michigan Press, Ann Arbor, 1970. Eric Grissell, Bees, Wasps, and Ants: The Indispensable Role of Hymenoptera in Gardens, Timber Press, Portland, Ore., 2010. Helmut Kovac, Anton Stabentheiner, and Sigurd Schmaranzer, “Thermoregulation of water foraging wasps (Vespula vulgaris and Polistes dominulus),” Journal of Insect Physiology, Vol. 55, No. 10 (October 2009), pp. 959-966. R. W. Merritt and K. W., Cummins, An Introduction to the Aquatic Insects of North America, 2nd Edition, Kendall/Hunt, Dubuque, Ia., 1984. E.C. Mussen and M.K. Rust, “Yellowjackets and Other Social Wasps,” University of California-Davis “Pest Notes,” Publication 7450, March 2012, available online at http://www.ipm.ucdavid.edu. Hal C. Reed, Richard Grantham, and Russell Wright, “Paper Wasps, Yellowjackets, and Other Stinging Wasps,” Oklahoma Cooperative Extension Service, EPP-7305, undated, available online at http://osufacts.okstate.edu. Vincent H. Resh and Ring T. Cardé, eds., Encyclopedia of Insects, 2nd Ed., Elsevier Academic Press, Burlington, Mass., 2009. Virginia Tech Department of Entomology Insect Identification Lab, “Household and Pantry Pests,” online at http://www.insectid.ento.vt.edu/fact-sheets/household-pantry-pests/index.html. Iowa State University Department of Entomology, “BugGuide,” online at http://bugguide.net/node/view/15740. Kenneth G. Ross and Robert W. Matthews, eds., The Social Biology of Wasps, Cornell University Press, Ithaca, N.Y., 1991. University of California-Davis, “Pests of Homes, Structures, People, and Pets/Yellow Jackets and Other Social Wasps,” online at http://www.ipm.ucdavis.edu/PMG/PESTNOTES/pn7450.html. University of Florida Department of Entomology, “Featured Creatures/Yellow Jackets and Hornets,” online at http://entnemdept.ifas.ufl.edu/creatures/urban/occas/hornet_yellowjacket.htm. Virginia Tech Insect ID Lab Fact Sheets, “Household and Pantry Pests,” available online at http://www.insectid.ento.vt.edu/fact-sheets/household-pantry-pests/index.html. For previous episodes on water-connections to insects, “Insects” category at the Index link (http://www.virginiawaterradio.org/p/index.html). 4.9 - Va. natural resources, including watersheds, water resources, and organisms. 3.4 - behavioral and physiological adaptations. 2.5 - living things as part of a system, including habitats. 3.6 - ecosystems, communities, populations, shared resources. 4.5 - ecosystem interactions and human influences on ecosystem. 5.5 - organism features and classification. 6.7 - natural processes and human interactions that affect watershed systems; Va. watersheds, water bodies, and wetlands; and water monitoring. LS. 4 - organisms’ features and classification. LS.6 - ecosystem interactions, including cycles and energy flow. LS.8 - community and population interactions, including food webs, niches, symbiotic relationships. LS.11 - relationships between ecosystem dynamics and human activity. BIO.2 - impact of water chemistry on life processes. BIO.6 - bases for modern classification systems, including structures, biochemistry, and developmental stages. BIO.8 - dynamic equilibria and interactions within populations, communities, and ecosystems; including analysis of the flora, fauna, and microorganisms of Virginia ecosystems.